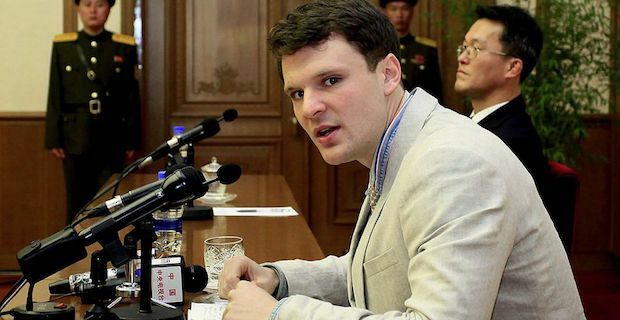 21-year old Otto Frederick Warmbier was visiting the capital city of North Korea, Pyongyang. As he was leaving the country from Pyongyang Sunan International Airport in January, he was detained as he was caught stealing a North Korean political banner. This was apparently taken from the hotel he was staying at, Yanggakdo International Hotel. He claims that one of his fellow church members from Friendship United Methodist Church in Wyoming, Ohio wanted it as a “trophy” where it could be used to “weaken the ideological unity and motivation of the North Koreans.” Warmbier was to give the member this in exchange for a car worth $10,000. There is yet to be evidence of this person. His detention wasn’t made public until February where he made a public confession and apology in front of the press and diplomats. Many believe he is being used as a political pawn. In one of his statements he cried out, "I apologise to each and every one of the millions of the Korean people, and I beg that you see how I was used and manipulated." He claimed he had been "lured by the United States administration to commit a crime in this country." Veteran US diplomat Bill Richardson was said to have met with North Korean officials at the UN meeting in New York where they discussed the release of Warmbier. Richardson has previously worked in negotiating the release of other American detainees. Unfortunately it appears that the most recent talk did not do any good.